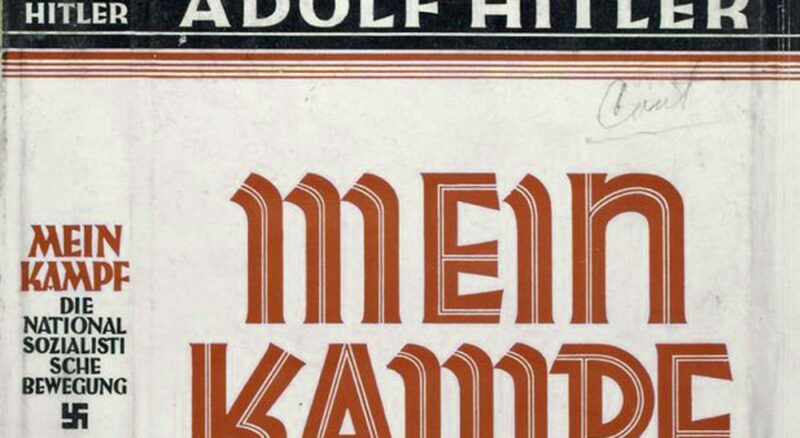 On Jan. 1, the Bavarian government's copyright on "Mein Kampf" expired. Adolf Hitler’s personal manifesto will soon be republished in Germany for the first time in 70 years. Calling for the elimination of the “Jewish peril,” the Bolsheviks, and “the weak and the sick,” "Mein Kampf" was published in 1925 to arouse the bloodlust of National Socialists. Selling millions of copies, it also proved to be a financial boon for Hitler. Once he came to power, every newlywed couple and every German combat soldier received a copy of the book, courtesy of the state. I land in favor of its educational value, as much for American readers as German ones, and especially now. Now Munich’s Institute of Contemporary History (IfZ), an organization founded in 1949 to study National Socialism, is issuing a heavily annotated version of this vile screed. According to a recent article in The Guardian, the IfZ’s objective is to exhaustively research and debunk it, “to show how Hitler mixed truths and half-truths with lies, to take the sting out of the propaganda at the same time as laying Nazism bare.” This annotated version is intended for educational use in schools and universities. But the institute’s objectives go beyond exposing the fallacies of Hitler’s ideology. They want to preempt the inevitable publication of "Mein Kampf" by neo-Nazi groups, to administer the vaccine before Hitler’s toxic beliefs once again start more freely circulating. But these ideas never went away. Digital versions of the book have been available in Germany online, in libraries, and in antiquarian bookstores. Nationalist and neo-Nazi groups have prospered throughout the world, and certainly not just among those who have read it. Nonetheless, some leaders of Bavaria and Germany’s Jewish community have expressed understandable concern and vigilance about the wider circulation that plain, unannotated versions of the book will likely achieve. Interestingly, nobody on either side of the "Mein Kampf" debate is framing this as a conflict between free speech and hate speech. Everyone recognizes that it is hate speech, pure and simple, and Germany, like many other Western countries, has laws prohibiting speech that advocates national, racial or religious hatred that incites discrimination, hostility or violence. Germans learned from their history, and unlike in the U.S., hate speech — regardless of whether or not it’s intended to directly incite violence — is not protected. Rather, the question is whether the educational value of the annotations in the IfZ’s edition will outweigh the potential harm of giving Hitler’s words broader exposure, even with tightly controlled distribution. In the late fall of 1986, my husband and I visited the site of the Dachau concentration camp. The day was gray and damp, but beyond the proximity of the camp to the streets and homes of this pleasant suburban town (belying the faux innocence of those who claimed not to know about the internment and genocide), what chilled us most was the Nazis’ meticulous classification of their victims. Prisoners wore different colored badges and were subjected to different types of medical experiments depending on whether they were Jewish or gay, a Gypsy or a Jehovah’s Witness or a Communist, indigent or cognitively impaired. The hierarchy of “the other” was detailed and the dehumanization complete. Even as I asked myself how these atrocities could have been committed and tolerated, I realized that the Nazis’ characterizations of their victims as vermin, as not only sub-human but as something to be eradicated, was sounding awfully familiar. Back in the U.S., a presidential primary campaign was just getting underway, and two months earlier, one of the Republican candidates, Pat Robertson, had been quoted in a New York magazine article saying, “… the great builders of our nation almost to a man have been Christians, because Christians have the desire to build something. He is motivated by love of man and God, so he builds. The people who have come into [our] institutions [today] are primarily termites. They are into destroying institutions that have been built by Christians ... The termites are in charge now, and that is not the way it ought to be, and the time has arrived for a godly fumigation." Substitute Muslim for Jew, gay for Gypsy, liberal for Bolshevik, and 'Mein Kampf' will quite comfortably belong in the library of contemporary American political discourse. These are the all-too-familiar voices of deceptive and demagogic paranoia. Substitute Muslim for Jew, gay for Gypsy, liberal for Bolshevik, and "Mein Kampf" will quite comfortably belong in the library of contemporary American political discourse. The IfZ’s republication of this book, with the historical annotations that explore and teach us about how Fascism begins, couldn’t come at a better time. Julie Wittes Schlack writes essays, short stories and book reviews for various publications, including WBUR's Cognoscenti and The ARTery, and is the author of “This All-at-Onceness” (Pact Press, 2019).